Our friend The American Resident has a new gig as a columnist for the Expat Focus web site. She is currently talking about being the only American in the village, and it got us thinking…. Being a foreigner does not hold the allure it used to, but if you’re going to be a foreigner here—in most cases—being an American is the way to go. I’m not sure why, but my being from America is more remarked upon than, say, the young woman at the coffee shop being from Latvia, is. Perhaps it’s because of our “special” relationship (I’m not taking the piss here, there really is a strong and unique bond between Yanks and Brits) or the fact that my being from somewhere else isn’t immediately obvious. It generally takes a few minute of conversation before someone I am meeting for the first time will enquire as to where I am originally from. So being an American, even in an area where I know there are other Americans lurking about, still sets me apart, and I like that. For one, it’s about the only thing that does set me apart—side from being a colonial, I can’t claim many other interesting selling points. Plus, it’s something I’m good at; I don’t really need to put a lot of thought into how to go about being a Yank, it sort of comes natural. In fact, the only drawback of being special due to my national status is the fact that I am always special. If I were there world’s foremost authority on dung beetles and their socio-economic role in Africa, I could just not mention (probably a wise move) it and there would be no sidetracking of the conversation, unless someone at the pub recognized me from Mastermind. But when someone cottons on to my American accent, there is no hiding the fact, and I have to stop the discussion, do the “elevator pitch” version of my story, and then get back to the subject at hand, unless those present decide they’d rather talk about America. So, on average, it’s good to be an American in Britain, even if you’re not the only one in the village. On the other hand….I sometimes get a bit tired of being “You know….that British woman”. I wouldn’t say I’m the only Brit in Chicago, there are literally thousands of us, but I’m usually the only Brit in my circles. I’ll admit, I can exaggerate my British-ness with the best of ‘em. A Margaret Thatcher-ish approach does wonders when I’m trying to return something or ask for something out of the ordinary and, as Stephen Fry pointed out a few years ago*, a British accent adds a certain gravitas and credibility on occasion. Heck, just being British has even resulted in a few TV appearances for me over the years. But sometimes I just want to fit in and be anonymous. (God, listen to me, I sound like one of those diva celebs.) One of the great things about landing at Heathrow every summer is the fact that no one turns to look at me when I talk. I am just one of many and no one’s really interested in where I’m from. From time to time that’s just bliss! As we've said before, Thanksgiving is a pretty big deal in the US, and consequently there can be a lot of stress associated with it. When something is hyped up to such a degree, there are always bound to be disasters and tears, most of which are only funny in hindsight. "We visited our newly married daughter, who was preparing her first Thanksgiving dinner. I noticed the turkey thawing in the kitchen sink with a dish drainer inverted over the bird. I asked why a drainer covered the turkey. She said, "Mom, you always did it that way." "Yes," I said, "but you don't have a cat!" "When I was a kid in Indiana, we thought it would be fun to get a turkey a year ahead of time for the following Thanksgiving. But by the time Thanksgiving came around, we sort of thought of the turkey as a pet, so we ate the dog. Only kidding. It was the cat." "My niece was in the kitchen garnishing the turkey on the platter for presentation. Her husband stood near her opening a bottle of champagne. The cork flew into the air and hit the overhead lights, which shattered and rained shards of glass all over the turkey." The first Thanksgiving I hosted for my in-laws saw me sitting with my right hand in a bowl of ice water for the entire meal. I had taken a large pot (like the one on the left) out of the oven, set it down and then grabbed the lid knob with my bare hand. Why it didn't register that it would be as hot as the pot itself, I don't know. All four fingers and my thumb had bright red, very painful burns on them which took weeks to heal. Got me out of the washing up though. One year, before the idea of being an expat occurred to me, I was doing Thanksgiving Day dinner with my erstwhile SO She-Who-Must-Not-Be-Named and her brother’s family. We were doing the prep and the rest of the clan were coming for dinner. After the pumpkin pies were made, because we were in a small flat (sorry, apartment—this was in America) we set them in the back bedroom on the floor to cool. There were four adults there but I was the only one with children and, as such, had developed that special radar—the one that tells a parent that it is too quiet. And then I thought about the dog. You know what happened. Very happy dog, two ruined pies. So we did what you do in those situations. We smoothed them over as best we could, put whipped cream on top and served them anyway. Nobody died. Nobody found out. 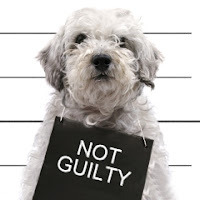 And nobody asked why the dog looked so smug. I was having a conversation with the blogger Not From Around Here and the word aeroplane came up. (For those who don’t know, it’s aeroplane in the UK, and airplane in the US.) Having been in the US for 21 years, the word aeroplane suddenly strikes me as funny and baby-ish. I’m not sure that I go all out and say airplane – more likely I just swallow the “O” sound in an attempt to avoid merciless piss-taking by the kids. It’s funny which words I’ve adopted and which I still cling to. While I can now easily pronounce basil the American way (bay’ zil), herb will never be ‘erb and tomato will always have two distinct T’s and a long A. Even though the kids imitate the British version of tomato, they would have even more fun if I came out with tomaydo. There are certain words that Brits just can’t get away with in the States, in much the same way that Americans in the UK should never say bloody. Just wrong. Some words you have to adopt if communication is your thing: the bonnet of the car becomes the hood, as the boot becomes the trunk. Same with baby paraphernalia – not many Americans know the words dummy and nappy (at least in the baby sense) so pacifier and diaper it is. School has been like an immersion course in Chinese, with recess instead of playtime or break, semesters and commencements, not to mention having to remember that high school kids go Freshman, Sophomore, Junior then Senior. Yes, I used to feel a bit strange using a different vocabulary but now I just consider myself bi-lingual! Bloody? I say bloody quite a bit, as in “Bloody hell!” I think I should be allowed this one as I used to say it in the States, long before I moved here. However, research suggests (i.e. I just asked my wife) that I do sound somewhat foolish saying it. I also say oy vey a lot, which is equally (so I’m advised) foolish-sounding. But none of that relates to this post and, furthermore, I have no plans to change. I have, however, changed other bits of my vocabulary. While I do not (not, not, not) have any hint of a British accent, so much British English has crept into my way of speaking that my friends in the States tell me I write like a Brit. I resisted this for a long time, as I really enjoy being the recalcitrant American, but after a while you need to start talking like the natives simply so you can get on with it. Unlike Toni, I don’t interact with people in situations where misunderstandings could prove critical (I am not, for example, in danger of handing Rescue Annie to a baby who need a pacifier) so I probably get away with using Americanism more than she can rely on Brit-speak, but I have added a fair few, handy Anglo words to my lexicon over the years. Some words have been completely adopted, such as car park, high street and town centre. I can’t tell you the last time I referred to a parking lot, or said downtown. Likewise the use of holiday: I have adopted this so completely it confuses my American friends. When I asked someone, who was telling my about their new job, how much holiday they got, they began listing off things like Memorial Day, Thanksgiving and the like. I had to stop them to clarify that I meant vacation time. Other areas have morphed into a mixture of British and American terms. For instance, the car still has a hood and a trunk, but I go to a petrol station to put petrol in it. In the kitchen, though I do the washing up and occasionally refer to the stove as the cooker, it is still, very defiantly, ta-may’-to, bay’-zel, or-egg’-a-no, a-lum’-in-um foil and Saran Wrap (never cling film). And, strangely, even after all this time here, I still tend to refer to prices using the term dollars instead of pounds. I was writing something the other day about American sports, and I went off on a bit of a rant tangent when I got to Cheerleaders. I can't stand anything about cheer-leading, and it's HUGE here. Second – it's extremely dangerous. 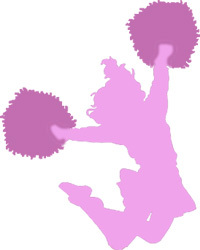 According to Wiki, of the US's 2.9 million female High School athletes, only 3% are cheerleaders yet cheer-leading accounts for 65% of catastrophic injuries among those girls. I certainly wouldn't be wanting my daughter at the top of those human pyramids. Third – it's dangerous because of some of the whack-jobs and the lengths they will go thru to win, or score a place on the team. Anyone remember the 1981 incident of Wanda Holloway, now known as the "Texas Cheer-leader-Murdering-Mom" after she hired a hit man to kill the mother of her daughter's rival for a place on the squad? Fourth – it's dangerous, according to a Texas politician, who, in 2005 sponsored a bill (affectionately known as "The Booty Bill") that would outlaw sexually suggestive cheer-leading routines at school events. (Good luck with that.) Not so much because it was demeaning to women, or inappropriate for the audience age, oh no. Because it would lead to "pregnancies, high school dropouts (and the) contraction of AIDS and herpes." Correct me if I'm wrong, but if these girls are being provocative and end up pregnant or carrying a yucky disease, isn't there usually a guy involved somewhere along the way? Oh yeah – and they're really, really irritating! But I couldn't help laughing when I read that there are an estimated 100,000 participants outside the USA now. Actually, Toni and I are not in total agreement on this: I think cheerleading is wrong on so many levels (no, all of them) in Britain, but I think it belongs in America. In fact, I think cheerleading belongs to America; it is embedded in its fabric, it embodies the very soul of what America is all about and it gives the girlfriends of high school athletes something to do. Cheerleading is loud, brassy, glitzy and entertaining without providing any real value—like a McHappy Meal or a weekend in Disney World—and what could be more American than that? No, I think that cheerleading and America go hand-in-pompom (that’s not a euphemism) and the American Experience would be poorer without it. So keep on cheering, America, and hang on to those cheerleaders, please, and stop them from infecting the rest of the world. So, yeah, we have cheerleaders over here now. Not a lot, and not as in-your-face as at a Dallas Cowboy's game, but they are starting to creep in, and it is giving me, well, the creeps. The soccer team I periodically go see play—the Brighton and Hove Ablion Seagulls—have cheerleaders. They are called Gully’s Girls, a reference to the team’s Seagull-outfitted mascot known as Gully (apparently these girls are his harem), and they have performed at every game I have seen. On the plus side, it gives the local gals something to do other than hang around the high street yakking on their mobile phones; god knows the youth here could use some diversions of the non-violent and non-alcohol induced variety, so good on them, they started a cheerleading squad. But that’s like opening up a quilting shop in the Sudan: it’s unnecessary, out of place and no one needs or wants it. For their efforts, the squad gets to parade around the pitch prior to the games, smile and shake their pompoms at the crowd (no, that’s not a euphuism, either) while collectively looking like a group of girls who were gathered up off of the high street, dressed in matching tee shirts and plunked down on a soccer field. They seem to know that they are there to do something, but they are not quite sure what it is. At half-time, they’re allowed to gyrate to popular music in the middle of the field while the fans stock up on more sausage rolls or queue up for the loo. They are [ad mode] as I have noted in my highly acclaimed and hilarious book, More Postcards From Across the Pond [/ad mode] like ants at a picnic: mildly annoying, not supposed to be there, but generally harmless. So we clearly do not need cheerleaders here, and while cheerleading incidents remain, for the time being, sporadic and local, there is always the chance that they may enter into the national scene, which would be just so, so wrong, and so un-British. I probably shouldn’t worry—the WAGS (wives and girls friends) are already celebrities over here, so they aren’t going to bother putting a squad together. The real danger is from random, amateur exhibitionists who delight in scandalous behavior in front of the entire nation. Keeping them out of British sport may require bringing back Big Brother, but if that’s what it takes to keep the nation cheerleader-free, I’d be willing to make that sacrifice. It would be for the greater good. 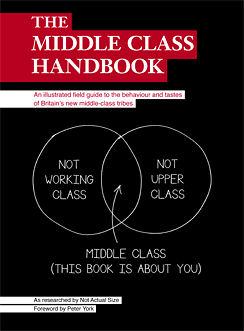 Came across a great new web site/blog the other day - The Middle Class Handbook - (An illustrated field guide to the changing behaviour and tastes of Britain's new middle class tribes".) It's also a book which is available on Amazon. How to describe the British middle class eh? It's not about money, since many of them have quite a lot and would certainly be Upper Class in the US. It's not even about what they do for a living - more about what they do in their spare time, really. Anyway, this web site is a hoot, and hits the nail on the head. There's a Middle Class Periodic table, and a short description of each of the emerging MC tribes here. Which one do you identify with, if any? 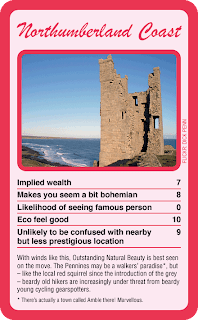 There's also a hilarious piece about Middle Class holiday destinations, with a map showing where the Middle Class goes, and how many points the place scores for "Implied Wealth" and "Eco Feel Good". Here's the one about Northumberland, which seems to score rather well. Not sure if that's a good or bad thing though. Being called "Middle Class" in the UK, is generally slightly derogatory these days, but it's difficult to explain why to non-Brits. Any offers?